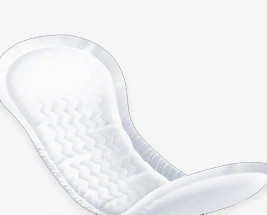 Women's Small Shaped Pads are suitable for those with light to moderate levels of incontinence. They are designed to fit a Womans body and are extremely discreet. They are also beneficial for those during or after pregnancy suffering from bladder weakness. Brands include TENA Lady pads, Cotton Comforts, Depends for Women all of which are designed for a comfortable fit as well as Lille,Molimed and Age UK which have the highest absorbency.